Up for the Cup in 2018!! This kit creates a special Japan Cup 2018 version of the Abilista, a popular Mini 4WD racer with stylish long nose short-deck form accentuated by sumptuous curves. 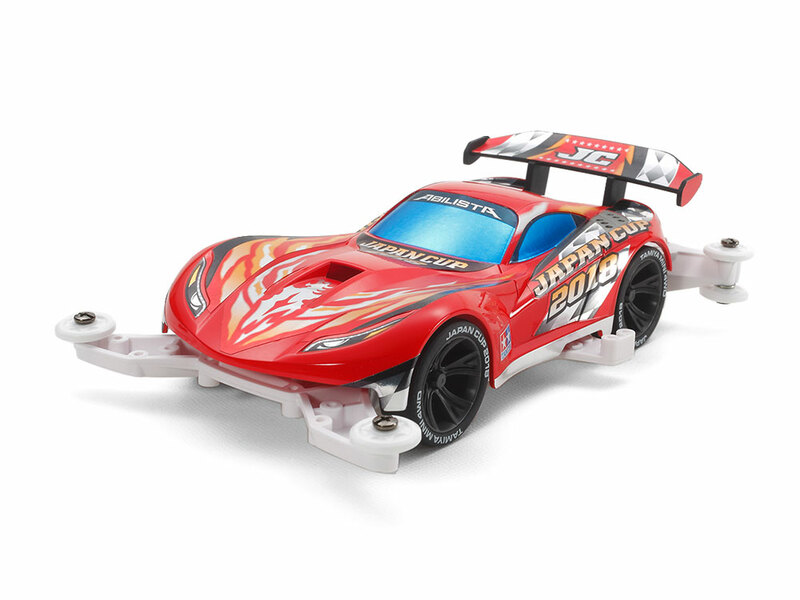 The body is molded in a racy red tone, with stickers included to create flame marks across the hood, chequers on the wing, and many more graphics! The model is based upon the speedy and aerodynamically-honed MA chassis, molded in tough polycarbonate-ABS plastic with low-friction battery holder, gear cover and more. The MA (Midship AERO) Chassis has its motor in the center, and features a design which focuses upon achieving outstanding aerodynamic performance. It has six individual low-friction rollers, a rear skid bar and other speedy features developed thanks to years of design experience. The single-piece monocoque frame also guarantees that assembling and keeping the car well-maintained is a task that can be performed by beginners and veteran racers alike. Here, the MA chassis features a 3.5:1 gear ratio, and is to be fitted with stylish gun metal color wheels and black super hard tires with sidewall lettering.